Brian Sibley is a writer and broadcaster responsible for over a hundred hours of radio dramas, documentaries and features. He is especially noted for his work on the BBC’s acclaimed serialisations of The Lord of the Rings, The Chronicles of Narnia, The Once and Future King, books by Ray Bradbury, Roald Dahl, James Thurber, J. B. Priestly, Laurens van der Post and his award-winning dramatisations of the works of Mervyn Peake. 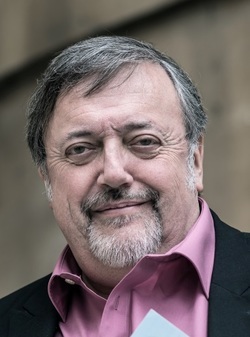 His feature and documentary programmes have been heard on BBC Radio 2, 3, 4 and the World Service and, as a presenter, he has hosted arts, books and current affairs programmes as well as chairing quiz programmes. Brian’s books include the chronicling of many cinema franchises including The Lord of the Rings and The Hobbit trilogies, the Harry Potter films, The Golden Compass and Chicken Run; histories of the Walt Disney Studio and Guinness Advertising; and biographies of the Reverend W. Awdry, C. S. Lewis and Peter Jackson.